Scroll down if you only want to change data location but not SpeedBase install location. Follow the instructions given below, if you want to permanently move both your data and SpeedBase installation to a new computer. This information applies to single user editions. Download and install SpeedBase to the new computer. Start SpeedBase on the new computer. On first startup it will attempt to create a new database, allow it to complete this step. Complete registration using your existing license key. Click "data" menu, click "exit" to terminate the software properly. Go to your old computer; locate your actual data folder (see picture below), copy that folder to a storage device. 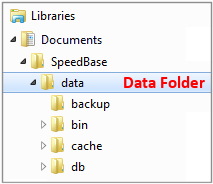 If you do not know the current location of your data folder, start SpeedBase on your old computer and then open connection settings from database menu. The path will be displayed under the label "data folder". Go to your new computer, paste the data folder to a desired location. If not already installed, install SpeedBase on the new computer. Start SpeedBase, if it requires you to create a new database, just click "continue" and cancel the next window. You won't use it anyway. Open connection settings window from "database" menu. Click the drop down box and set the data folder preference as "custom". A folder browser window will open. Navigate to the location where you just pasted your migrated data folder and select the data folder. Select also your database file name. Click "test connection" button to test the connection. Save changes. For multiuser license: Repeat the last step on all client computers. Do not confuse the data folder ("DATA") with the database folder ("DB") or any other folder. Follow the instructions given below, if you just want to change the location of your data to another folder, storage device or a computer on your local network. Start SpeedBase, click "data" menu, click "exit" to terminate the software properly. If you have a multiuser (TeamWork) license, you should repeat this step on all other clients and make sure that no instances of SpeedBase are connected to your database. Locate your current data folder (see picture above), copy that folder. Navigate to the target location where you want to keep your data. Paste the data folder there. Make sure that the target location has both read and write permissions. The location should also be a shared folder if multiple client computers will connect. Beware that, the target location may not be a virtual drive (like Dropbox etc.) unless you are connected via a VPN connection. Caution! If your data folder is located on a shared network drive, you should navigate and select it by browsing thru the network. Do not directly select it from your hard drive even if the shared folder is located on your local computer. Start SpeedBase, open connection settings window from database menu. Click the drop down box and set the data folder preference as "custom". A folder browser window will open. Navigate to the target location and select the data folder. Select also your database file name. Click "test connection" button to test the connection. Save changes.